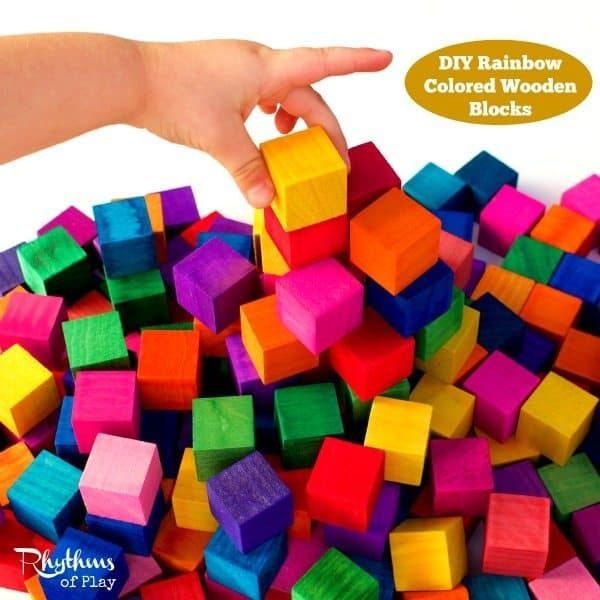 Making your own rainbow colored wooden blocks is fun and easy. When I was coloring blocks while making this Tetris Inspired puzzle my daughter loved playing with them. I decided to make a bunch more just for fun. She loves them! 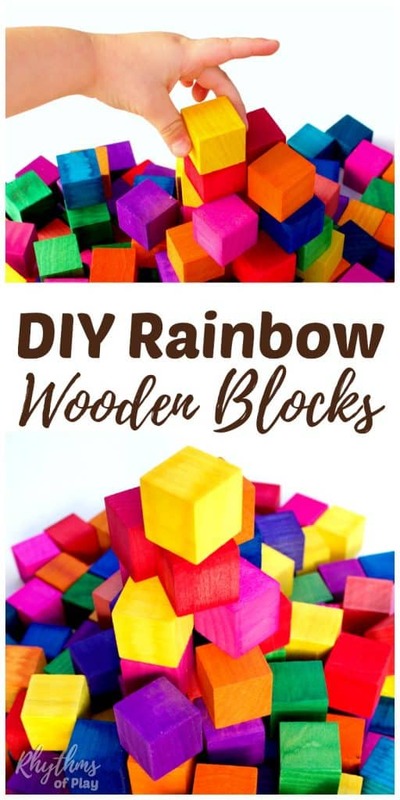 Rainbow colored wooden blocks are an easy DIY kids toy. These vibrant building blocks make a great gift idea for Christmas and birthdays. They will provide years of educational play based learning. You may also like DIY Rainbow Peg Dolls and this collection of the best DIY blocks for kids. Asia Citro over at Fun at Home with Kids has also made some “Grimm Style Blocks” like these that you can see HERE. Below I share how I made these rainbow colored building blocks, and give a comparison between the two most popular brands of liquid watercolors to help you decide which you would like to use. 1. 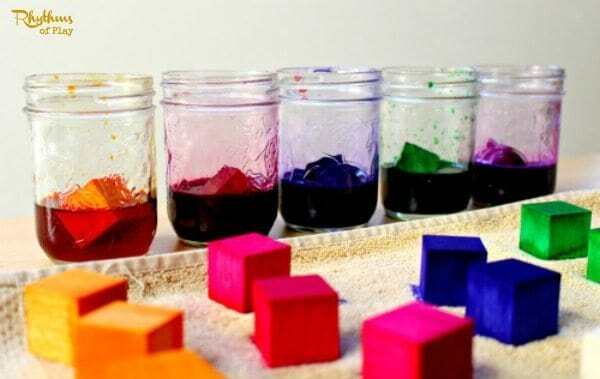 Place watercolors in canning jars to color the blocks. 3. Use tongs to take blocks out of color and place on an old towel to dry. If using more than one color at a time like I did, make sure you have another rag to quickly wipe the color off of the tongs before dipping tongs in next color. 4. Repeat until all blocks are colored. Allow to dry. In the photos below you can see how the Sax liquid watercolors looked on the blocks when dry. They claim that the set comes with eight, 8oz colors–blue-green, red-violet, blue-violet, fuchsia, coral, pink, yellow-orange, and yellow-green. The set I received had two red-violets with no blue-green so you will not see it below. One deduction point for Sax! The photo on the bottom left has the colors in the following order from left to right; yellow-orange, coral, fuchsia, pink, red-violet, blue-violet, and yellow-green. In the photos below you can see how the Sargent liquid watercolors looked on the blocks when dry. This set comes with 10 4oz colors. Overall I preferred how the Sargent colors looked and worked. But there were a few of the Sax colors that I loved as well. I ended up coloring more blocks with the Sargent colors. Update: I can not find the exact set I used on Amazon for this comparison. If the link above does not work try this Sargent liquid watercolor set that contains green, brown turquoise, black, magenta, orange, blue, red, yellow, and violet. The photo on the bottom left has the colors in the following order from left to right; yellow, orange, red, magenta, violet, blue, green and Turq-blue. The set also comes with brown and black but I did not use it. As you can see, making your own rainbow colored blocks is pretty easy to do. I hope my liquid watercolor brand comparison helps you decide which you would like to use. I liked having both brands (Sax’s fuchsia, red-violet, and blue-violet are gorgeous) but would choose Sargent if I had to choose only one. You can also mix and dilute colors for more variety if you like. I have a lot more projects planned to make with these rainbow colored blocks like this DIY Waldorf Square and this Tetris-inspired Puzzle Cube. Be sure you sign up for my newsletter below so you don’t miss all the fun! For more ideas follow my DIY Toys, Dolls & Games Pinterest board. Follow Nell @ Rhythms of Play’s board DIY Toys, Dolls and Games on Pinterest. These are beautiful! I’m going to have to give these a try! I’m excited to make these! Curious – did you do anything to seal the paint color onto the blocks? As these are watercolor paints I’m wondering if the paint would come off of the blocks if the kids have wet fingers or if they are left outside in the rain, etc…? No, we did not seal the blocks and yes, the watercolor paint might wash out a bit if they got wet. You can seal them with a white PVC glue like Mod Podge or use a beeswax polish, but we never really found the need. The Grimm rainbow blocks are left raw to keep the sensory nature of the wood intact for young fingers with developing sensory systems. The long answer is, you don’t need to protect them but if you want to make sure that they are sealed use Mod Podge or a Beeswax polish.